I made this image on a very important day in Rocky Mountain National Park history. 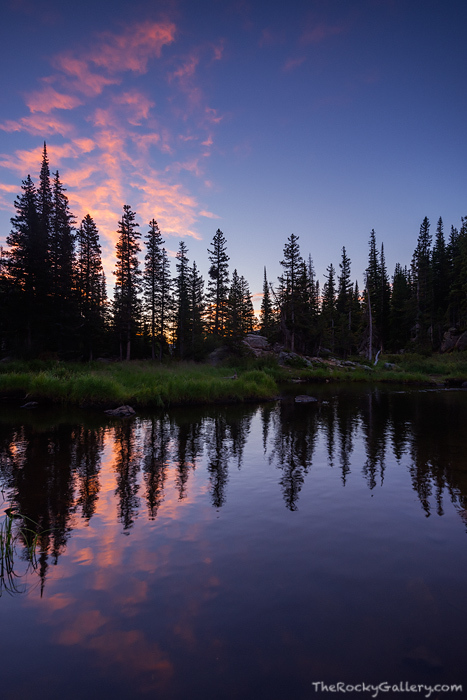 I photographed this small tarn just downstream from Dream Lake on the morning of September 4th, 2015. 100 years prior Rocky Mountain National Park was officially dedicated with a large contingent of supporters in Horseshoe Park. This morning another large contingent of supporters including the Director of the National Park Service as well as the Govenor of Coloradp would gather to redicate Rocky a few miles away at the Glacier Creek Campground. As a photographer who loves to photograph Rocky Mountain National Park more than any other location on the planet, I had all sorts of ideas of where I would shoot Rocky on her 100th birthday. Unfortunately the weather had other plans. The winds were howling this morning and the skies were free of nearly any clouds. Overall conditions were not looking great for landscape photography on this special day. It seemed fitting to end up at Dream Lake on Rocky's centennial morning as this was one of the first locations I ever photographed in Rocky Mountain National Park. I headed up to Dream Lake to enjoy the moment of this place that holds a very special place for me. As I arrived at Dream Lake before sunrise the winds were just relentless and the skies were still cloudless. To get out of the wind I headed just below Dream Lake to this small tarn that is part of Dream Lake's outlet. Because of the trees and rocks around this tarn it's a location where one can shelter from high winds. Just before sunrise one of the few if only clouds in all of Rocky Mountain National Park glided into view. It was not the most dramatic sunrise or set of clouds i've photographed in Rocky, but the symmetry this cloud formed over this small tarn was just perfect. In a sense this small scene, sheltered from the wind, typified why I have such a great appreciation for places like Rocky Mountain National Park. In the grand scheme of things, Rocky Mountain National Park is a small geographic area, untouched, primal, wild and free. When the world gets to be too much and one needs to find solice, Rocky Mountain National Park and places like Rocky act as a shelter from the winds of the world. It's difficult to put into words just how important wild and free places are to both myself and the human spirit, but thankfully we have managed to preserve some of our remaining wild places. Happy Birthday Rocky!. Photo © copyright by Thomas Mangan.